Every so often, a new product comes along that’s so great, it makes you angry it didn’t already exist. This morning, that product is PrivacyFix, a free plugin for Chrome that tells you nearly everything you ever wanted to know about how your online activity is being tracked, and fills in your online privacy holes with a click. But that’s not the best part. 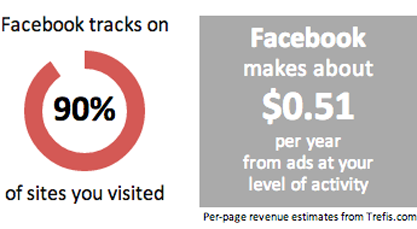 Unlike other tracker blocker plugins, like Ghostery or Do Not Track Plus, PrivacyFix provides an estimate of exactly how much revenue you generate for Facebook and Google through your online activities. It’s an insight into the inner workings of the Web’s money machine that few of us have had access to in the past. According to PrivacyFix, I am worth a whopping $0.51 per year to Facebook — a surprisingly low amount, though I am far from a heavy Facebook user. 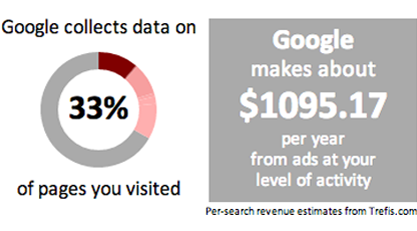 For Google, that number takes a wild leap up to $1095.17. Other Digital Trends staffers who tested out their PrivacyFix stats showed similar disparity between Facebook’s and Google’s earnings from a single user. Clearly, Google know something about online advertising that Facebook does not. Of course, these numbers are only estimates, and do not come directly from the companies themselves. Instead, PrivacyFix, created by online privacy company Privacy Choice, has teamed up with stock analyst startup Trefis, which provides the figures. The decidedly nifty data value estimate feature aside, PrivacyFix’s primary function is to alert you to the porousness of your online privacy in Facebook, Google, and other websites. It automatically analyzes your Facebook privacy settings, and alerts you to areas that are leaking your data. To update your settings to the most secure option, just click “fix.” The same goes for Google. 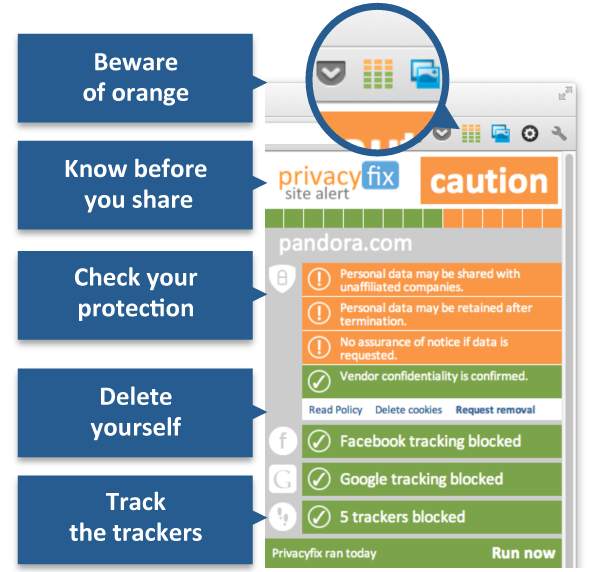 PrivacyFix also tells you which websites may share your personal data, plus which data brokers and advertising networks have installed tracking cookies on your machine, and provides an equally quick way to shut off the flow of personal data. Finally, PrivacyFix provides an optional “healthbar,” which appears in the top-right corner of your browser at all times, and gives you a visual cue of how much of your personal information is being shared on each website you visit. While other plugins provide similar services, Brock says that PrivacyFix gives users a number of benefits that competing products do not. “Three things really distinguish Privacyfix from other privacy tools: it’s super easy to use, it’s comprehensive and it’s balanced because we show you the tradeoffs in the decisions you make,” he said.